They just finished up a show in Nagoya, so Kananan asks if there were any particular memories of the city that they should talk about. Rinapuu has memories, but not of the city. At the catering area for the Hello!Con, they had shokupan, which is basically white bread cut really, really thick, available to eat, and Meimi had brought a new spread to put on toast and made some for Rinapuu, so she had a feast on bread and toast with special sauce and she made also made it for Natsuyaki Miyabi and Sugaya Risako. That was what she remembered about Nagoya. Kananan also reflects on the catering, and says that they generally have a tradition in H!P where they each put food on someone else’s tray as they go through the line. Earlier, they had some spaghetti, and Kudou Haruka put some on Kananan’s plate and asked her to reciprocate, but she never said when to stop and she ended up taking so long to put more and more on that she missed out on some of the other food. Rinapuu says that a couple people put noodles on other people’s plates but didn’t put any sauce on them, and she saw Inaba Manaka wait for Meimi to put some on her plate but Meimi just did her own instead. It’s not a perfect system. Kananan says that she also got to go out into the city a little bit to do a talk show event with Dawa and Rikako. Kananan got to be the discussion leader for the event, which made her really nervous, but it made her happy and it ended up being a lot of fun. That’s still not really related to Nagoya, but okay. Lately, Kananan has made a habit of watching movies because she has bought a lot of DVDs but hasn’t watched them, so for the past week or two she’s been watching a movie every night before bed, sometimes two. As a result, she has seen… a lot of movies. Instead of doing one long film review this time, she’s going to go through all the movies she’s seen lately and just say a word or two on them so that people know what they’re about. One film is LDK, which is a romance about teenagers who move in together. That was fun. Kawaki was not. It was really, really scary, and she had a nightmare about it involving the 6 S/mileage members murdering each other that terrified her. She also watched Batsu Game, Jinrou Game, and Ousama Game, which are all in a similar genre of school horror murder-game. Rinapuu was a big fan of Ousama Game and owns both the movie and the manga, and she reports that the movie does vary slightly from the original story so it was interesting to see. She also really likes that genre of horror/thriller, so Kananan recommends she watch the other Game movies, as well. They both liked how it had C-ute and Berryz Koubou members in it and praised their acting, and they hope that someday they’ll get to do a movie like that with another group like Juice=Juice. This reminds Rinapuu of Gomen Nasai, starring Buono!, which Kananan has not yet seen so no comment on that. She also watched World War Z, the zombie movie with Brad Pitt. This is another scary movie that had some parts that Kananan admittedly had to cover her eyes for. This one will also give you nightmares, according to her. She also watched the movies Another and Avatar (not the one you’re thinking of), both of which star Hashimoto Ai. Kananan thinks that Rinapuu would like Another since it’s that same sort of classroom murder thriller. The ending in particular was very interesting. She saw Ao Haru Ride in theaters with Takechan and Love, Rosie with Maro. These were only recently in theaters so she feels like she can’t say too much about them, which angers Rinapuu, who really wanted to see Love, Rosie and wants to hear about it. Out of all the movies she’s seen recently, the one that had the most impact on Kananan was The Curious Case of Benjamin Button. Rinapuu has never heard of it, so Kananan explains the essential plot premise that he’s born like an 80-year-old and ages in reverse, and that makes her very eager to see it. Kananan really liked this film, as it showed one person’s life from birth to death and all the challenges they undertook, and it made her realize that life is what you make it and you need to enjoy it while you can. Even though at the time of this broadcast, Big Hero 6 had not yet come to Japan, Rinapuu is obsessed nonetheless and has begun collecting merchandise from the movie because Baymax is an adorable robot. She convinces Kananan to go see it at some point, although in a very Rinapuu-fashion, she refuses to commit to going with her. The letter comes from Azumin, who addresses their letter “to the angels,” which tickles Kananan to bits, so she has difficulty reading the letter. They want to know who they hang out with backstage at the Hello!Cons, either with other Ange members or with other H!P members. 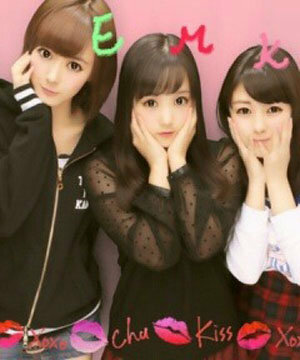 Rinapuu has been rather good friends with Ishida Ayumi and Suzuki Kanon since doing Lilium together so she speaks to them a lot, but this time she has spent more time with Miyabi. Part of this is due to it being Berryz’ last Hello!Con and Rinapuu doesn’t know when she’ll get the chance to see all of them perform again or to speak with them, so she’s happy she gets to talk to her so much. As for Kananan, she’s really good friends with Ikuta Erina and Manaka. She’ll go out with both of them independently but they’ll also hang out with all three of them. Pretty much anytime she’s bored, she says, she goes and meets up with one or both of them, so they naturally gravitated towards each other backstage. Kananan finds it interesting that they all have such different personalities, with Erina being somewhat obstinate and independent and Manaka being more delicate and a good listener and Kananan being a gorilla, but they all get along quite well. 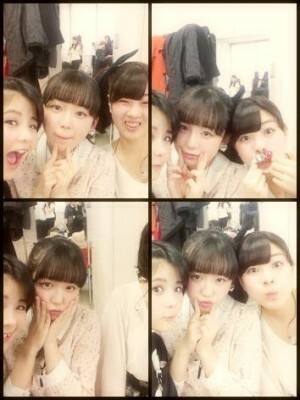 She’s also spent some time around the other Osaka members, Uemura Akari and Ogata Haruna. It makes her happy to be able to talk about Osaka and speak in her native dialect to them, even if there seems to be some disparity between them, namely, according to Rinapuu, that Ogata is cuter than her. As Kananan is caught up in thinking about how cute she is compared to Ogata, she can’t read the promotional ads at the end of the show. Rinapuu: Yeah, reading is hard, huh? Rinapuu: What? It hasn’t been a long time at all. Kananan: No, it hasn’t, it’s just been a long time since I did it with Rinapuu watching me. Rinapuu: We did it just last week. -> I will have everything, please.